More and more, it has been reported that diseases and pests that normally affect exotic species are now visibly attacking native flora. Over the past years there has been a surge in the number of epidemics killing off trees e.g. 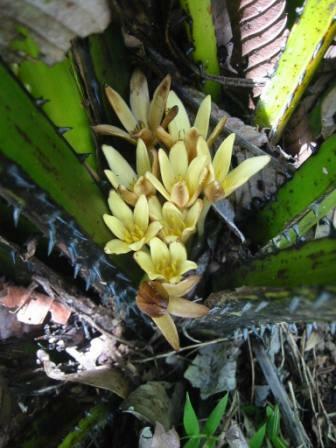 Calophyllum inophyllum (Takamaka), Pterocarpus indica (Sandragon) and Erythina sp. (Mourouk), not to mention the recent introduction of pests such as spiralling white fly, melon fruit fly, papaya mealybug and new coccid species, which may pose a real threat to some endemic plants. At the Botanical Garden, scale insects, mealy bugs, aphids and leaf miners have been observed on Wright’s gardenia and Bwa Dir blan. The spiralling white fly has been reported on Curculigo (Koko maron) and other native species. Quite a number of endemic species in glacis (boulder field) habitats seem to be affected by pest/pathogen problems which reduce the fruit set. On Silhouette and some parts of Mahe, although the mature Kapisen trees are producing viable seeds, very few saplings can be found, indicating that something is killing off the seedlings before they reach the sapling stage.